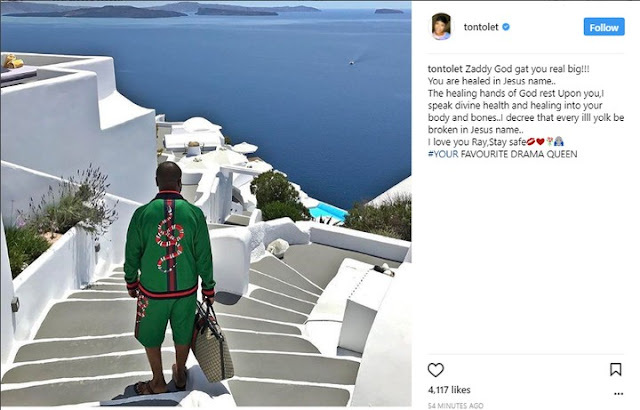 Ok, This is Very Very fresh, And am serving this Tea very hot, Now for someime now there has been rumor that Tonto Dike who was abandoned by her Hubby Churchill is dating Nigerian Gucci rep, Hushpuppi. It all started on his Birthday while celebrating him she called him her ''King'' (Photo is below), I got the screenshot but didn't blog it cos, i was like, It might just be normal king stuff. Now Fastforward to abou 30mins ago, the Actress and mother of one just shared a Photo of him, and wished him quick recovery, and to top it all she declared her love for him..
As if that's not all, she removed the comment section of the post..Its a good thing to fall in love again.. Happy for her..